Mannington Wood Floors - Still With World's Of Elegance! For warmth and charm, nothing surpasses the beauty of wood floors and their exceptional beauty makes them easy to live with. Mannington wood floors 7-step UltraWear Plus finish with ScratchResist™ adds a durable surface that never requires waxing or refinishing and provides greater resistance to everyday household scratches. Of course, the UltraWear™ Plus finish also makes their floors extremely easy to maintain. Mannington uses only premium select wood species for our top face and 100% North American hardwoods for our inner plies for beauty and durability that shows. Their 5-ply, cross-grain construction makes every Mannington Hardwood Floor far stronger than a single, solid piece of wood. They warrant that their products won't warp, buckle, or gap. Mannington's 7-step UltraWear™ Plus finish with ScratchResist™ is a polyurethane/aluminum oxide finish that provides unsurpassed protection against normal wear. Each UltraWear™ Plus step is an ultraviolet cured process they've pioneered. It gives their solvent-free finishes wear-and-scuff-resistance along with depth and clarity you just can't get any other way. Waxing? Polishing? Forget it! 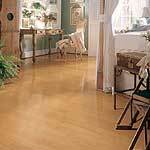 ScratchResist™ helps to protect against fine scratches that dull the finish of wood floors. It is now available on all Mannington Wood Floors™. Mannington Wood Floors™ are made to be installed virtually anywhere. At, above, or below ground level. In kitchens, basements, attics-places where ordinary solid wood floors can't survive. The UltraFit™ tongue & groove system is precision engineered using diamond-tip tooling. That means you get a uniform and stable fit whether you glue, staple, nail, or float your installation. Along with exceptional durability, the UltraWear™ polyurethane finish delivers long-term protection against normal wear and scuffs. Just follow simple maintenance techniques like regularly sweeping or vacuuming, cleaning spills promptly, and strategically placing mats, rugs, and casters. No damp mopping is required. It takes more than twice as many trees to produce a traditional solid wood floor as it does to produce one of Mannington's floors. Plus they use water-based stains and finishes that don't contain harsh solvents, and their adhesive system is formaldehyde-free. For more information on Mannington wood floors, please click on the links below.